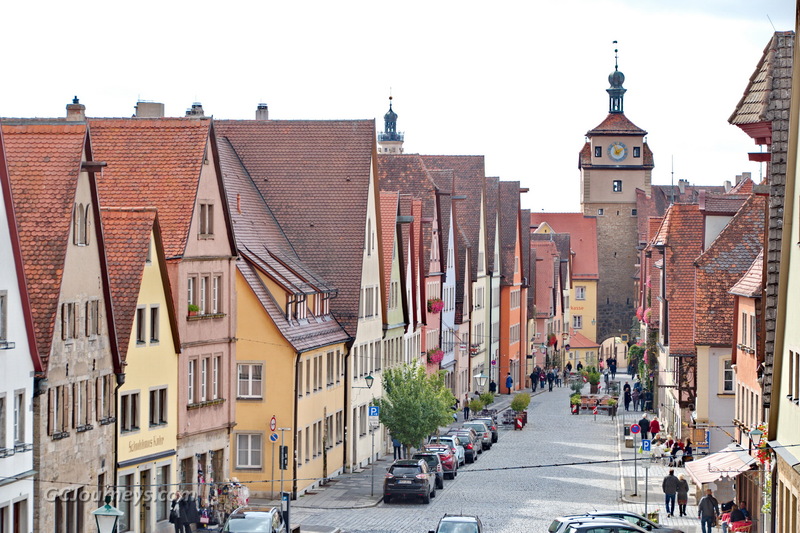 The next day started with a 45-minute bus ride to Rothenberg, which dates from the 10th century and features undamaged 14th century city walls. 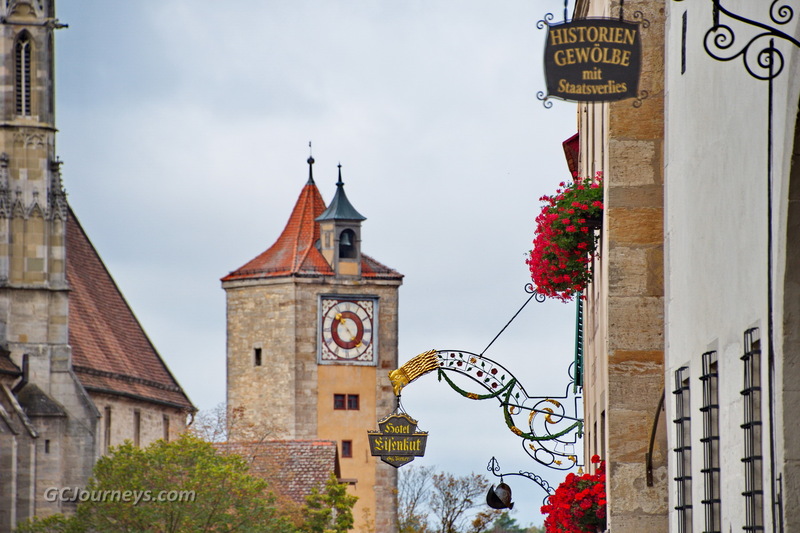 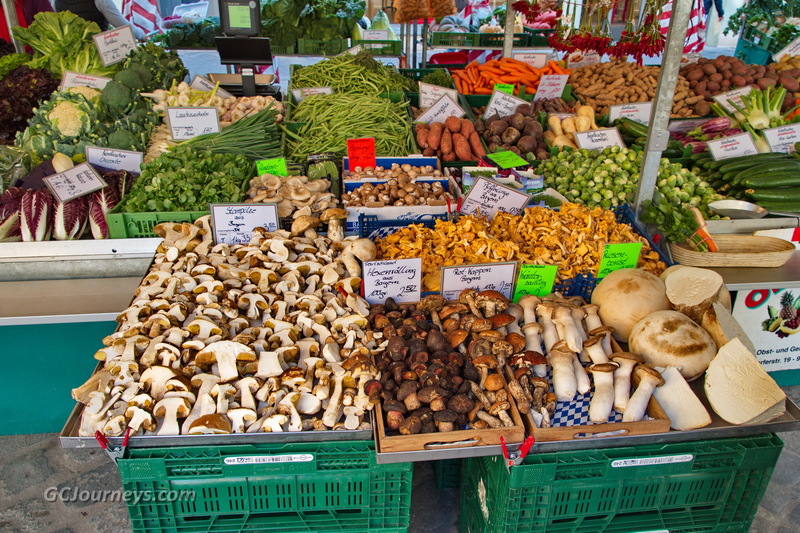 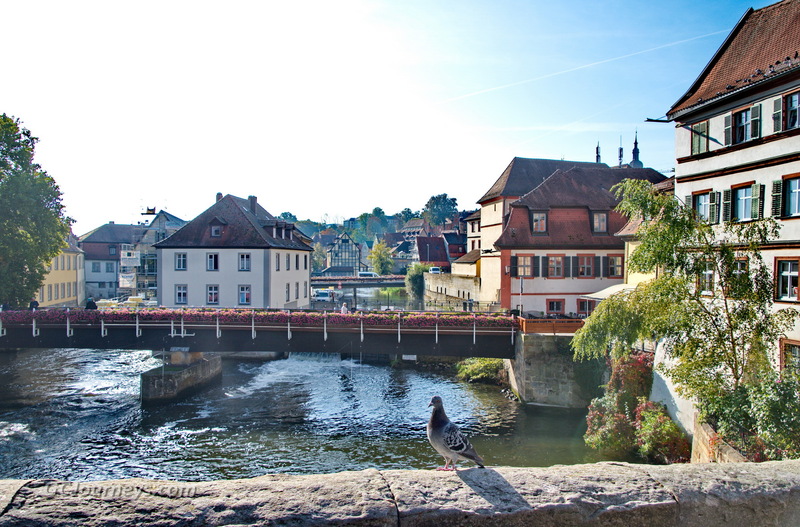 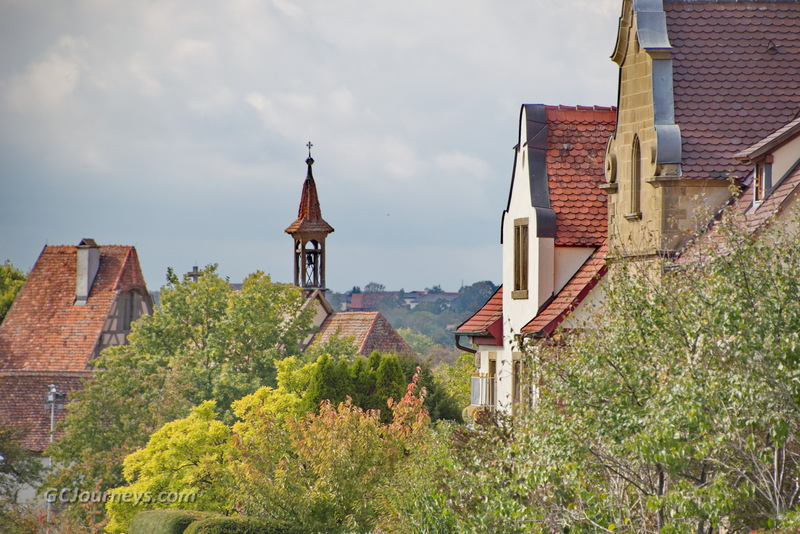 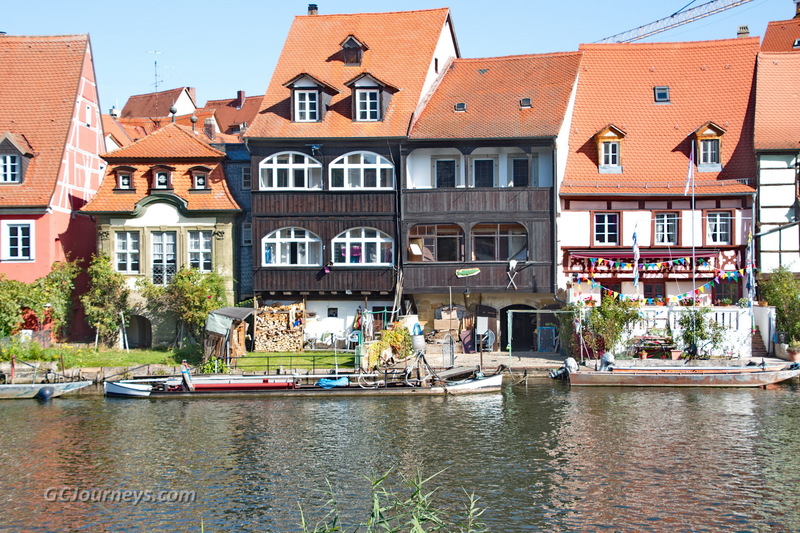 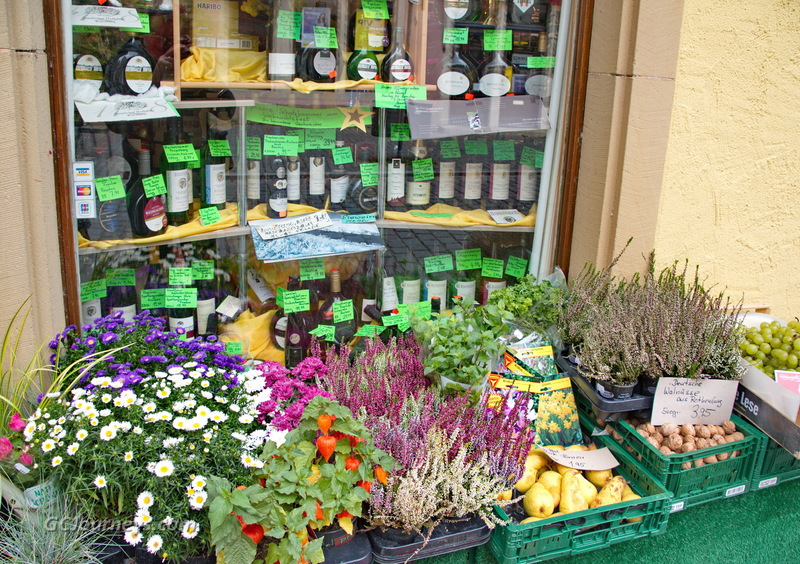 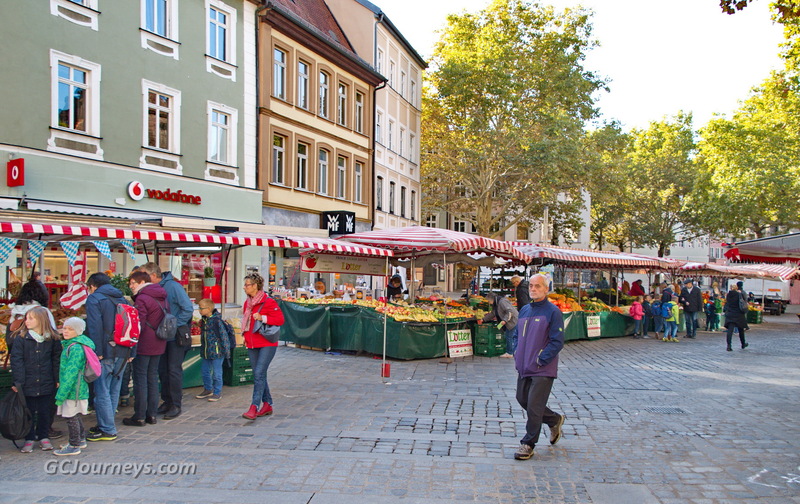 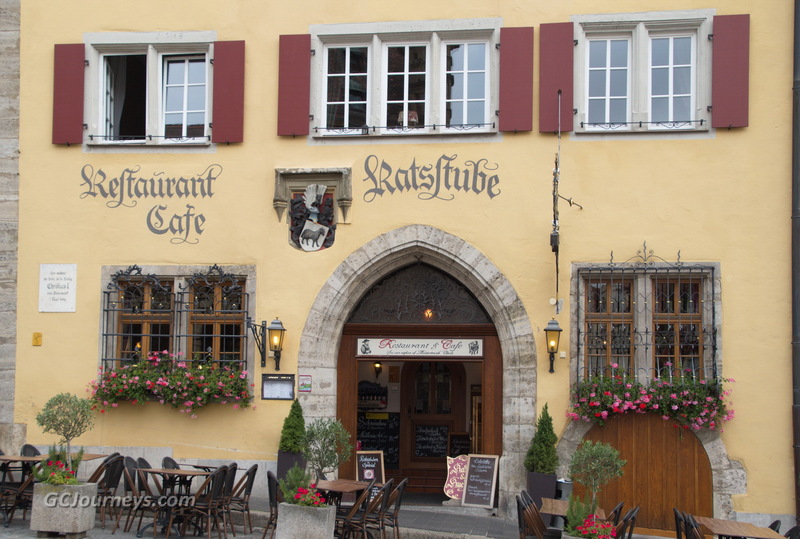 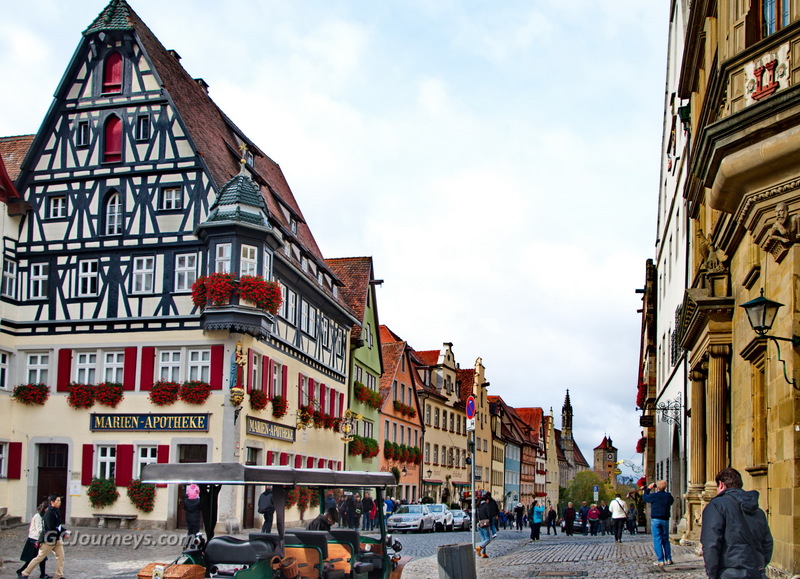 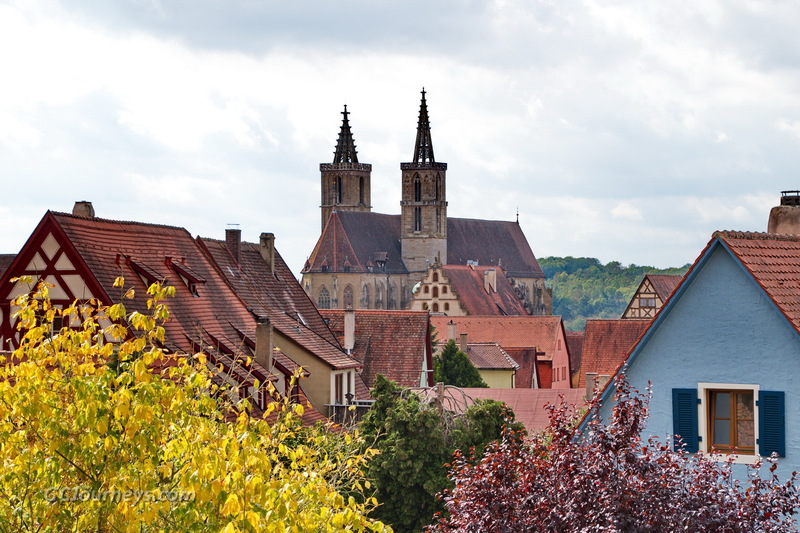 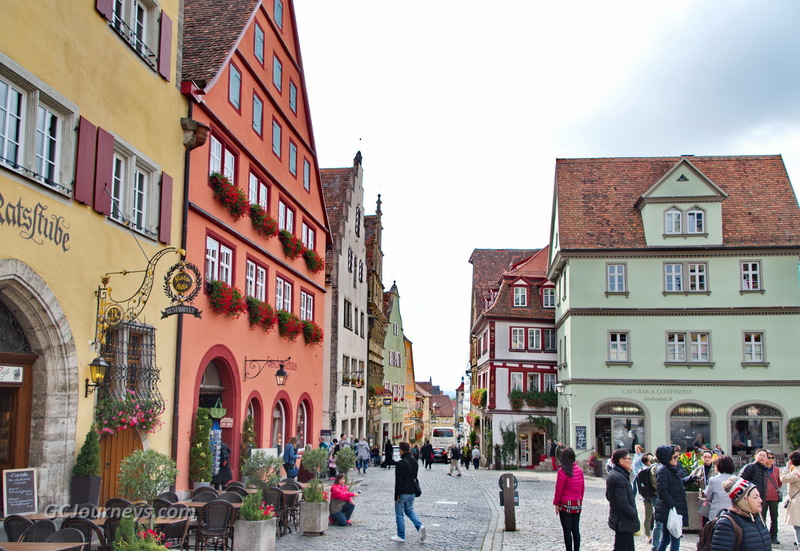 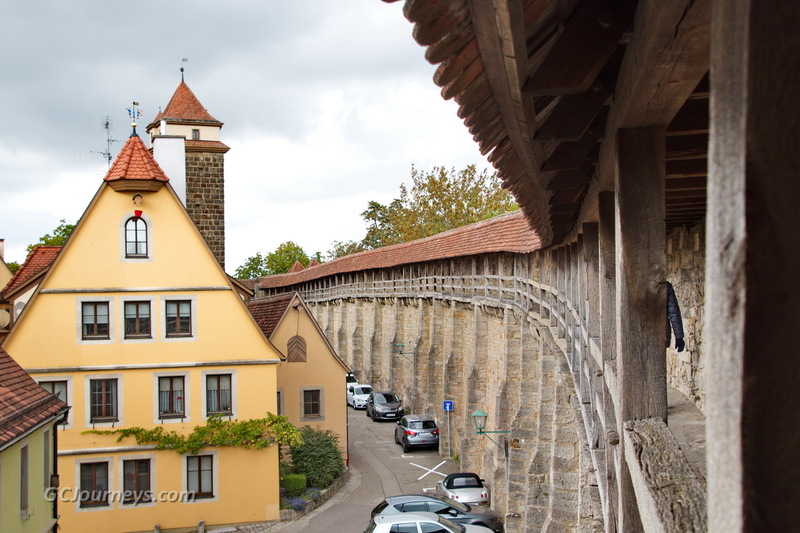 A very beautiful city on the Tauber River, Rothenberg is a “quintessential German” town. 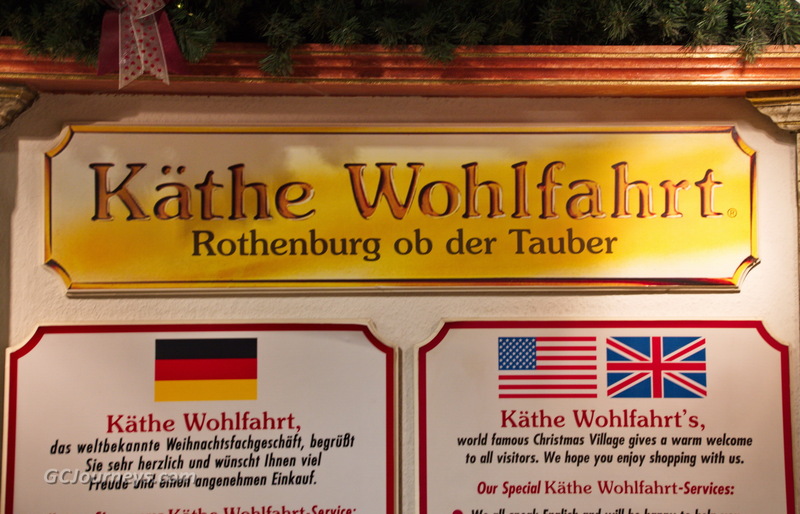 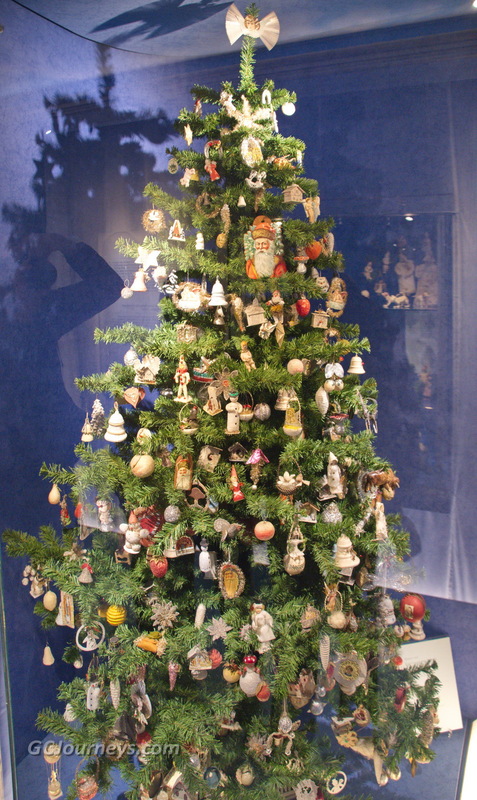 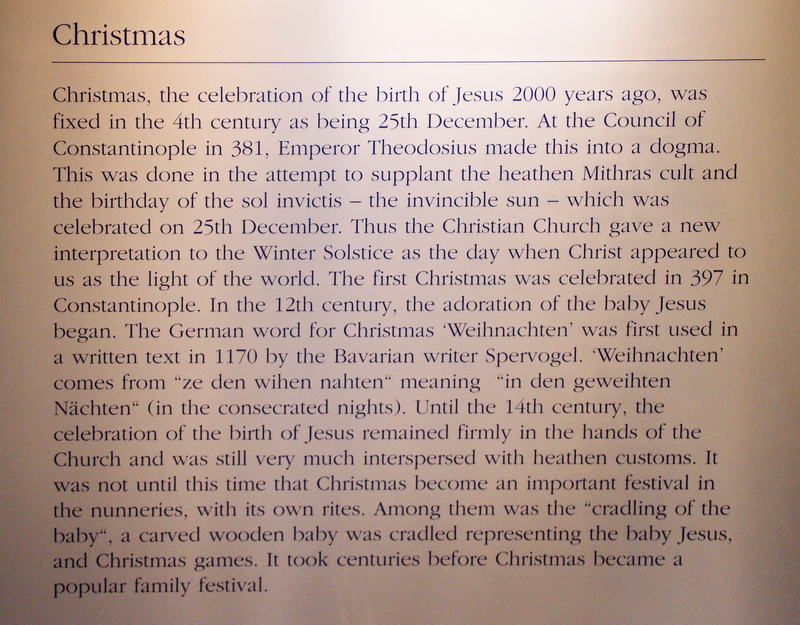 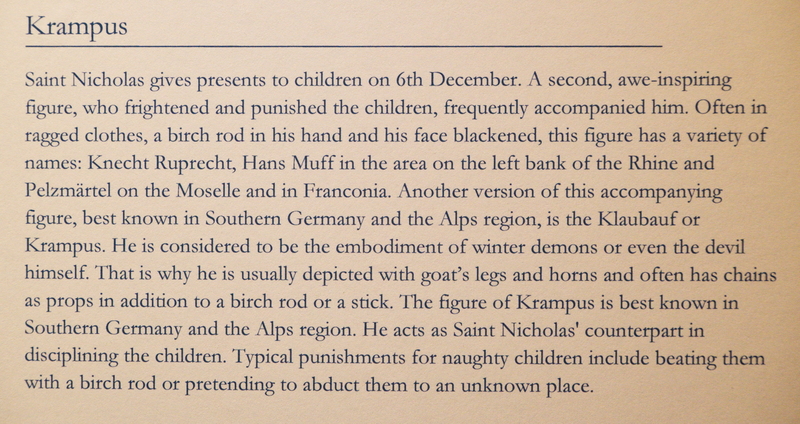 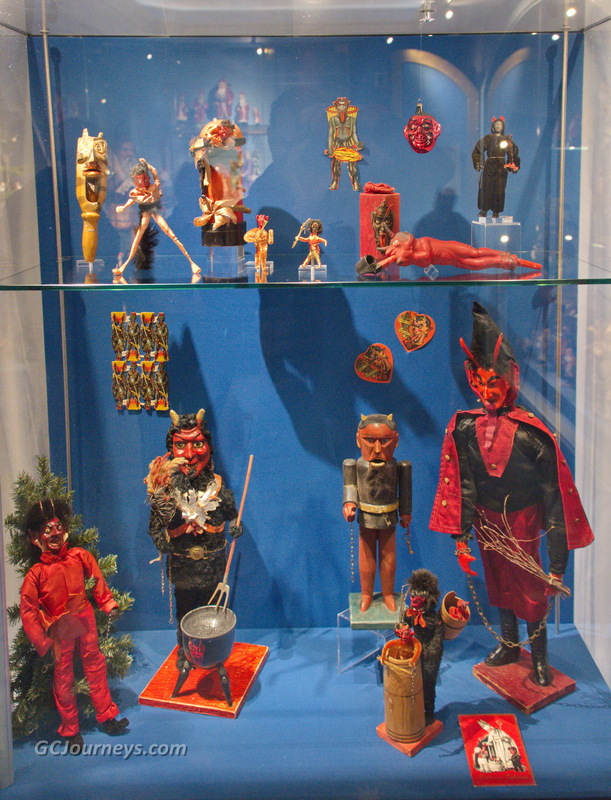 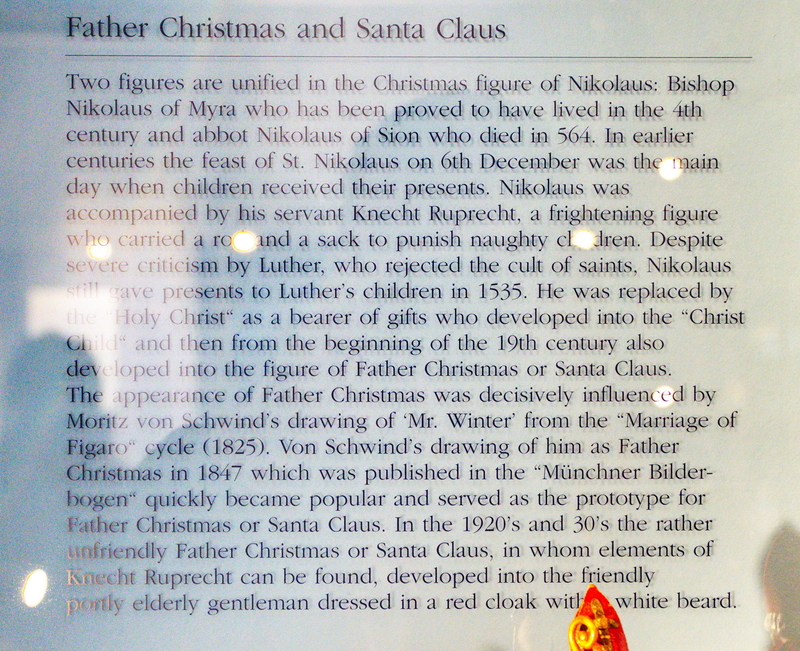 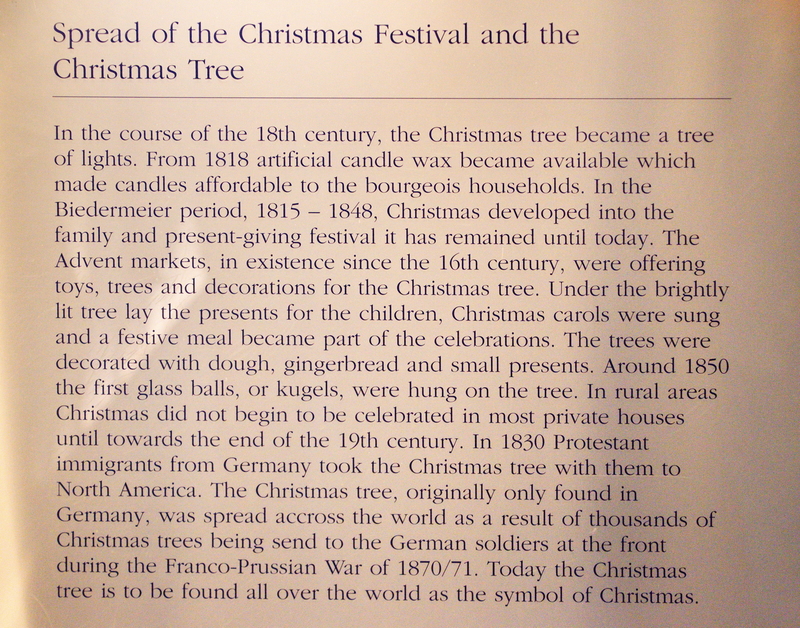 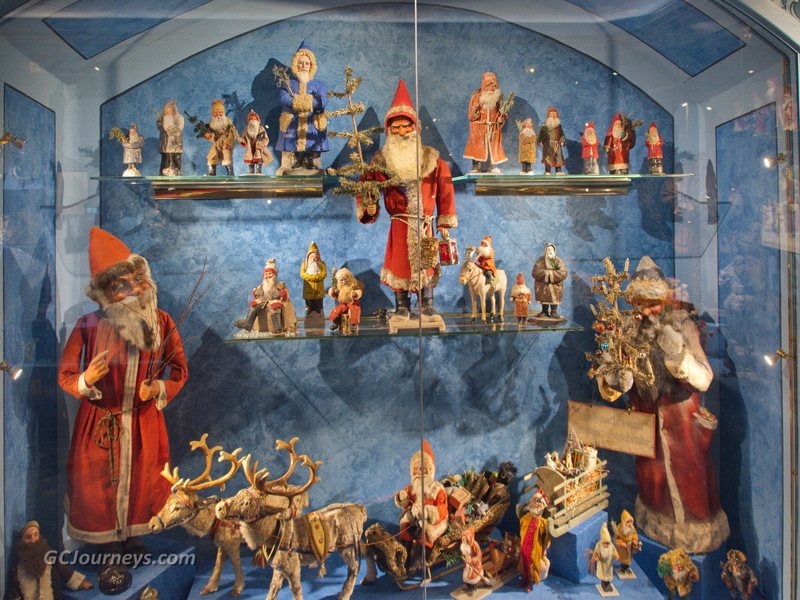 The Käthe Wohlfahrt Christmas Tree store houses an extensive Christmas museum, as well as thousands of ornaments for sale (we only bought two of them). 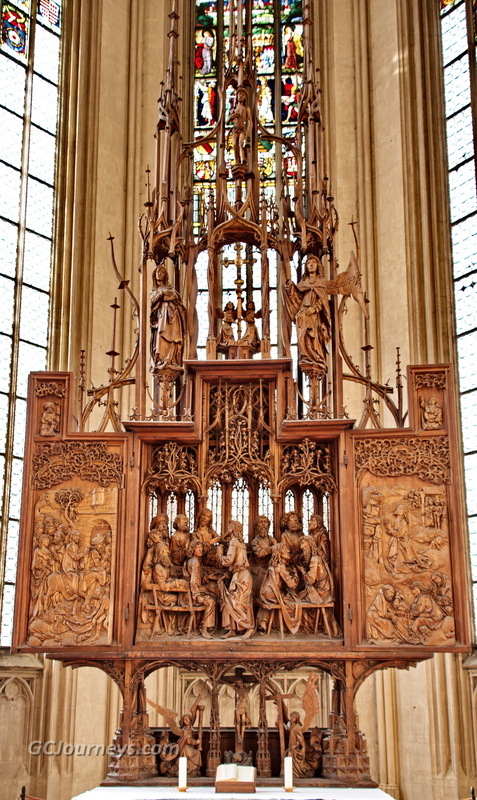 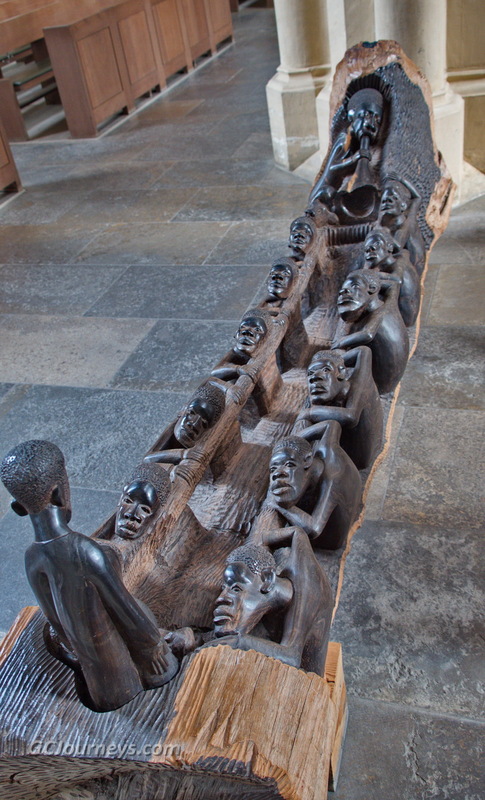 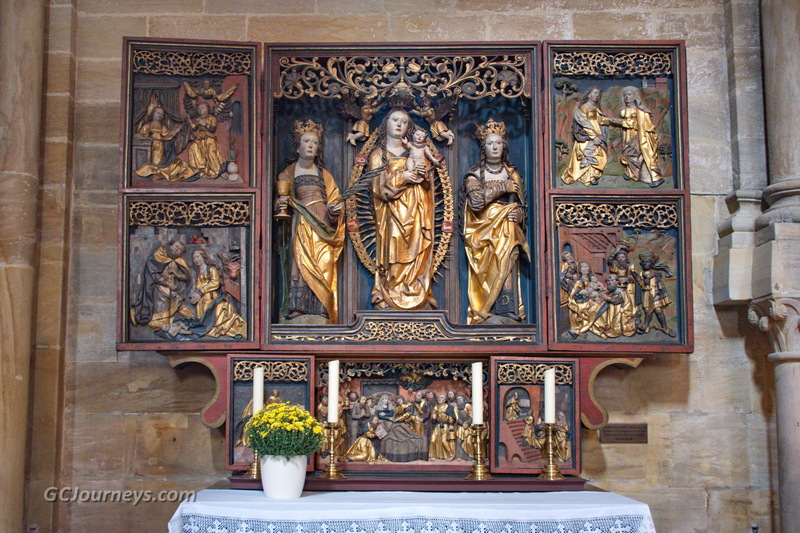 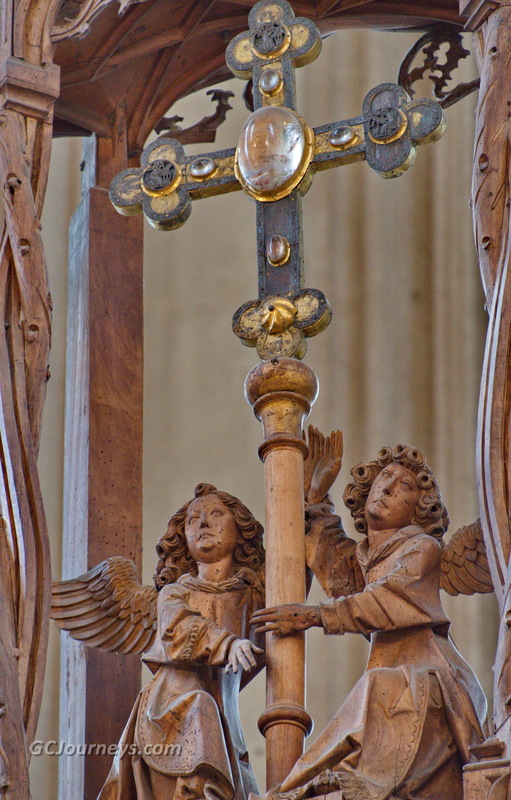 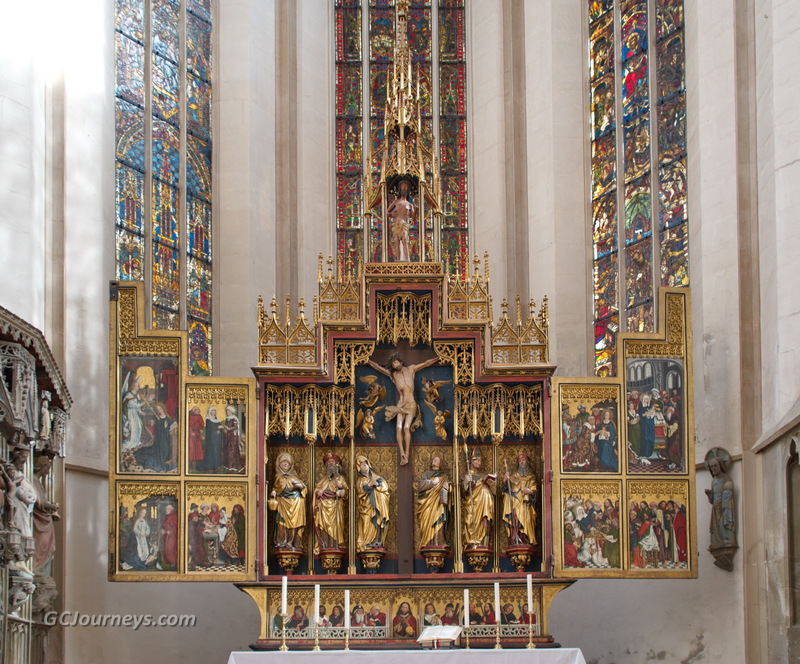 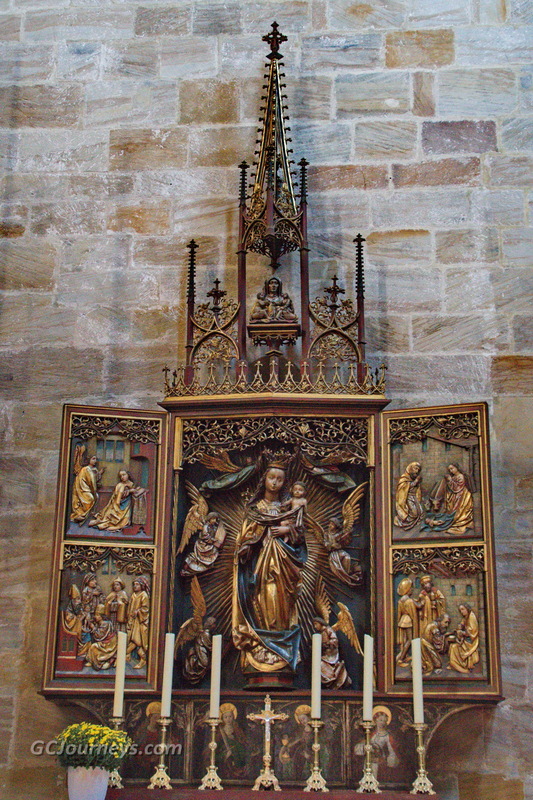 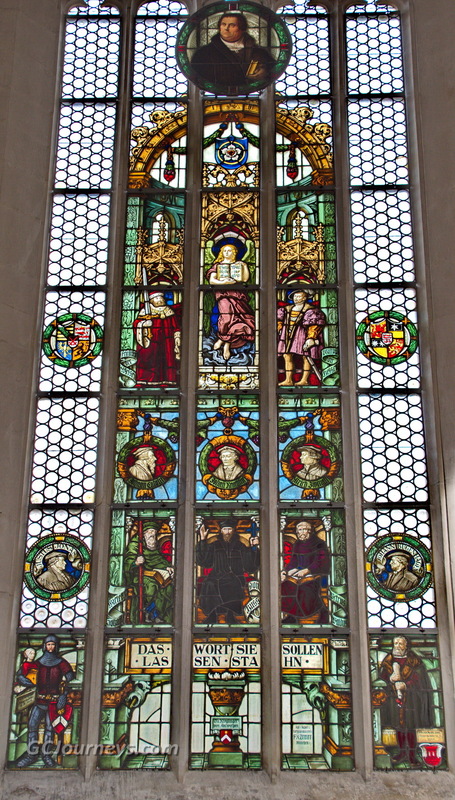 St James Lutheran Church, built from 1311 to 1471, is home to several intricately carved altars, including the Altar of the Holy Blood carved from 1499 to 1505 to hold a relic that was believed to contain a drop of Christ’s blood on a splinter of the cross (in a crystal capsule on the central cross). 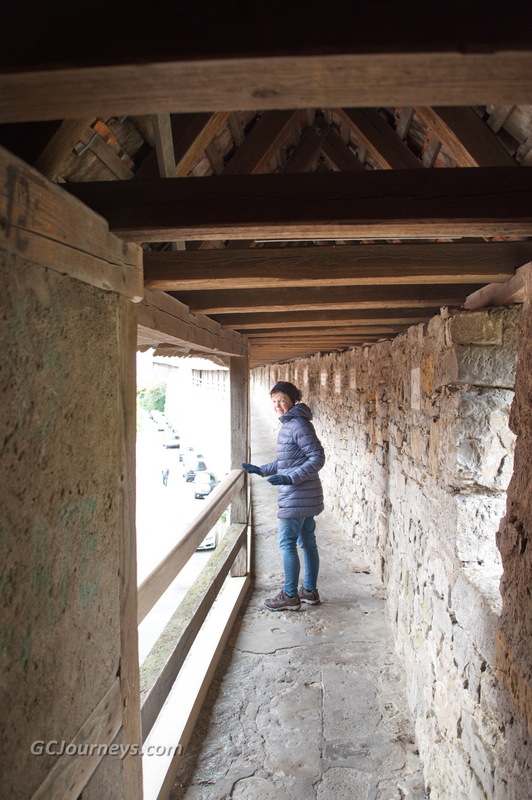 After our guided walking tour Connie and I walked along the top of the wall for about a third of its length around the city. 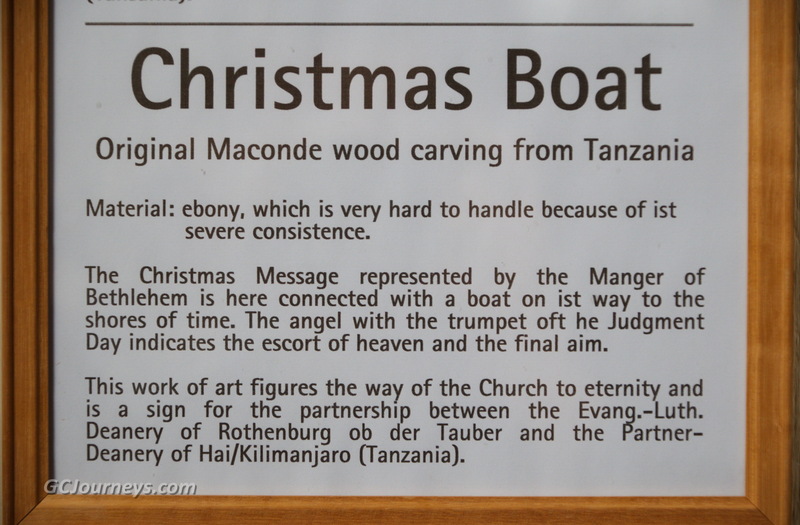 After dinner on board we were entertained by zither player Johannes Schubert. 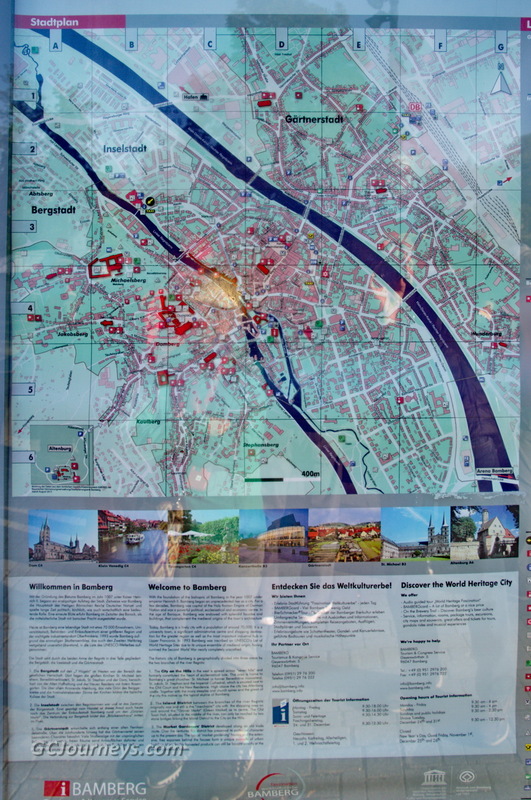 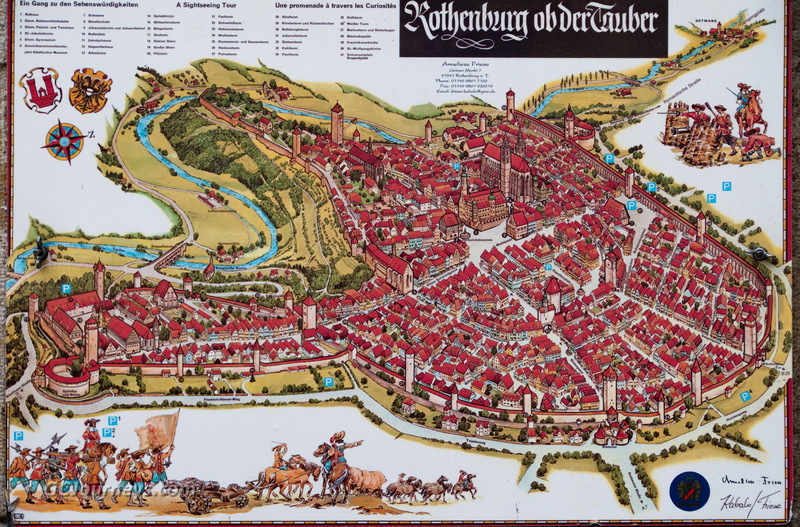 Our last stop before leaving the Main River was the city of Bamberg, founded in 902. 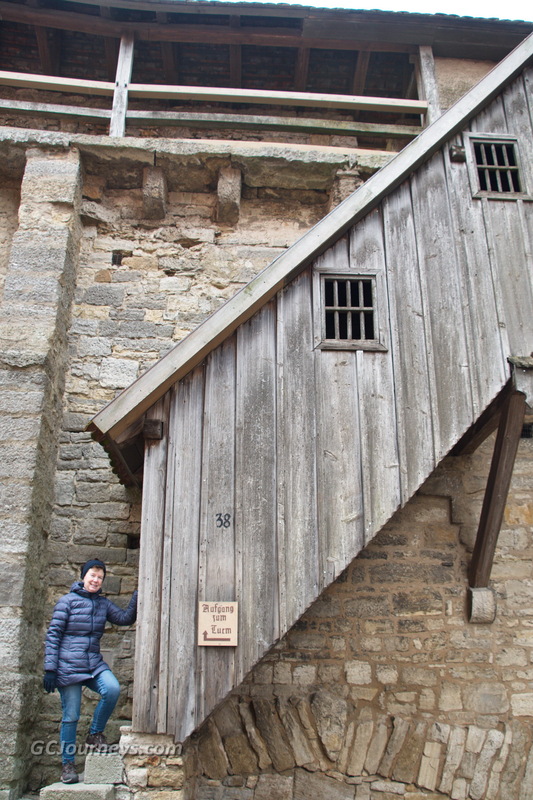 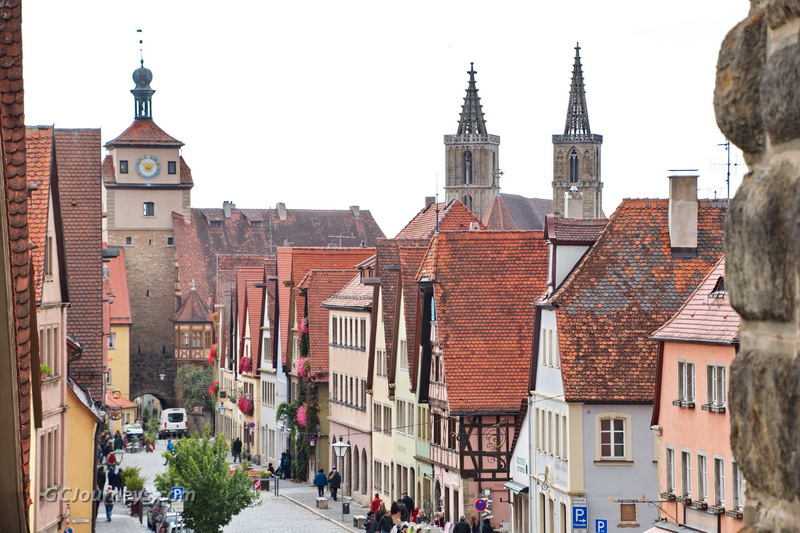 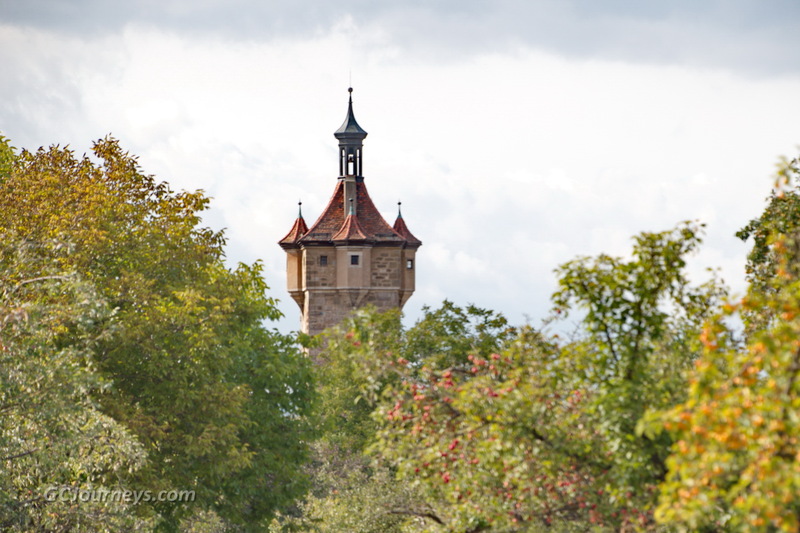 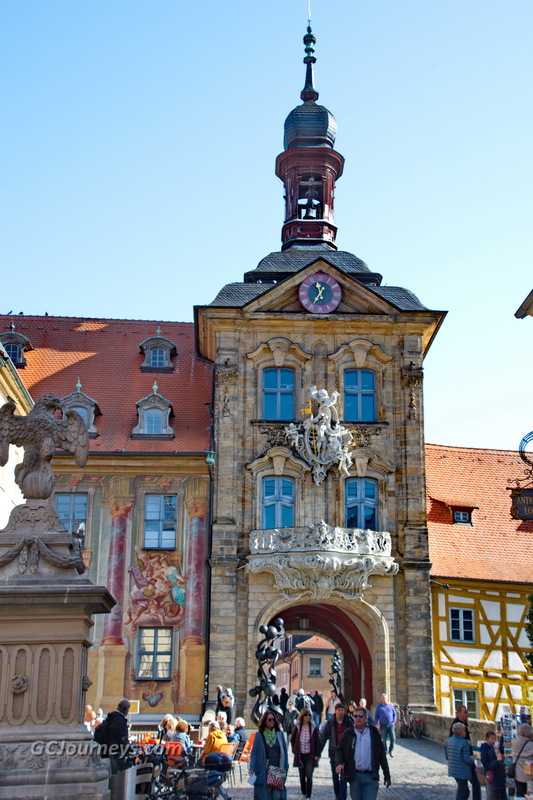 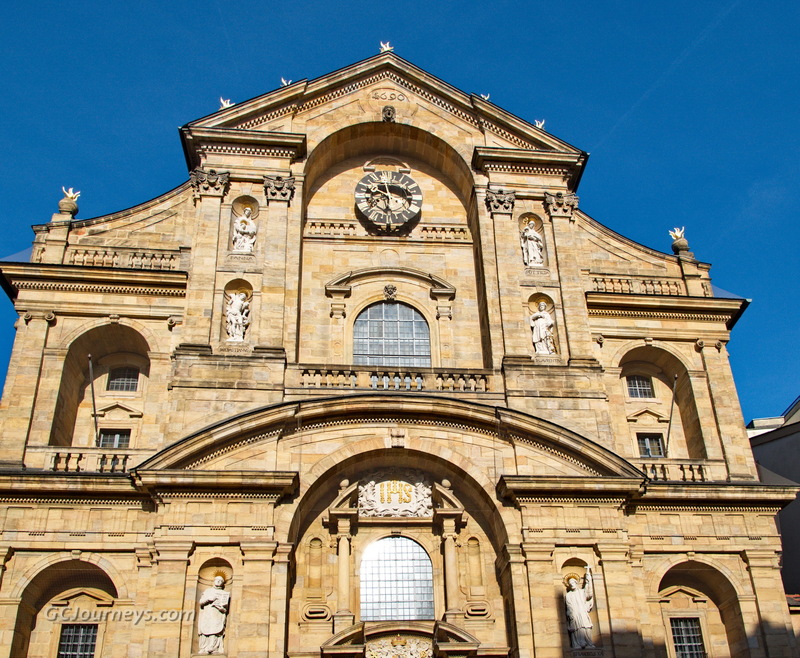 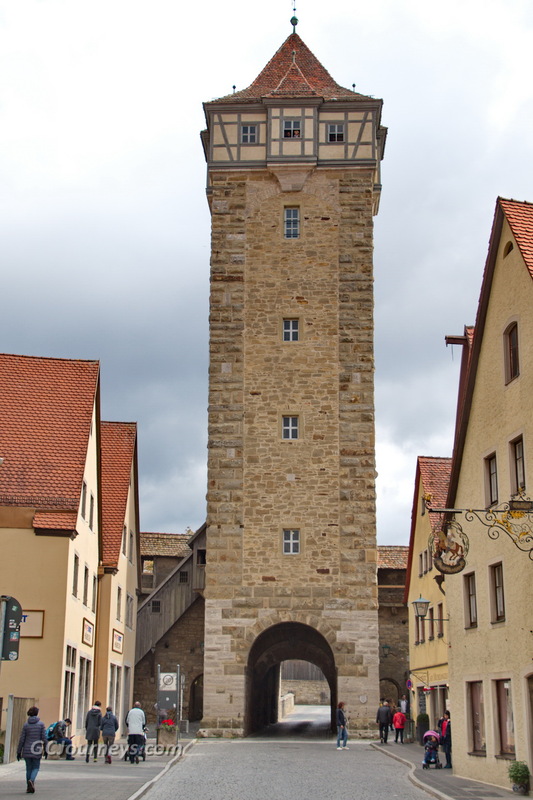 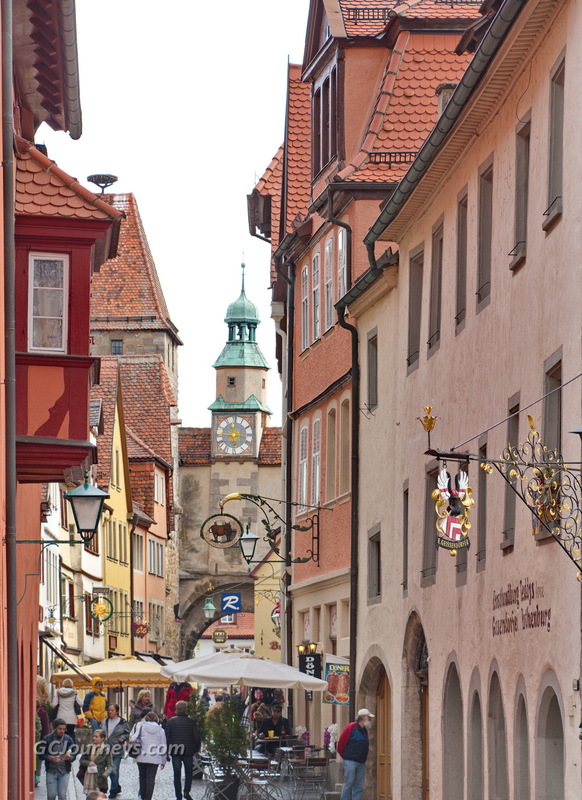 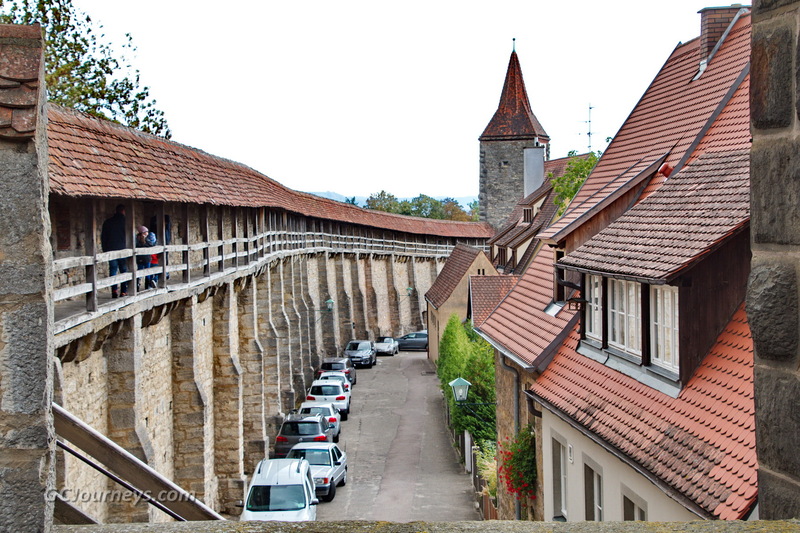 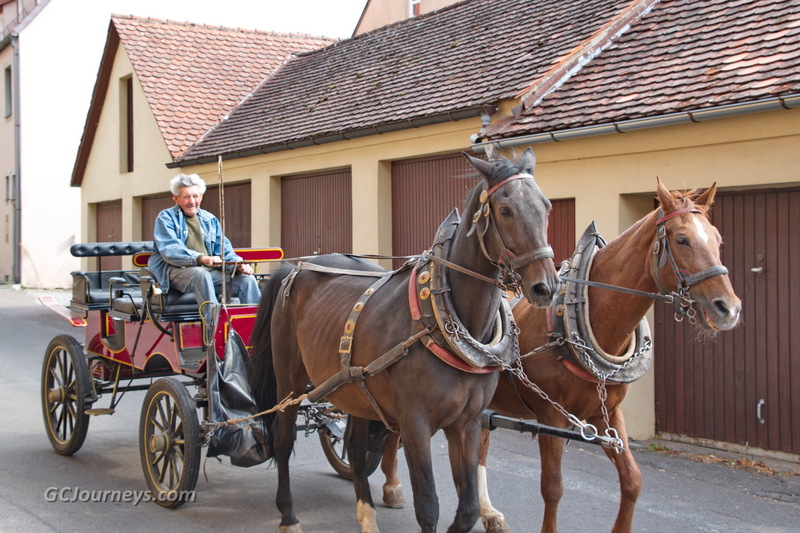 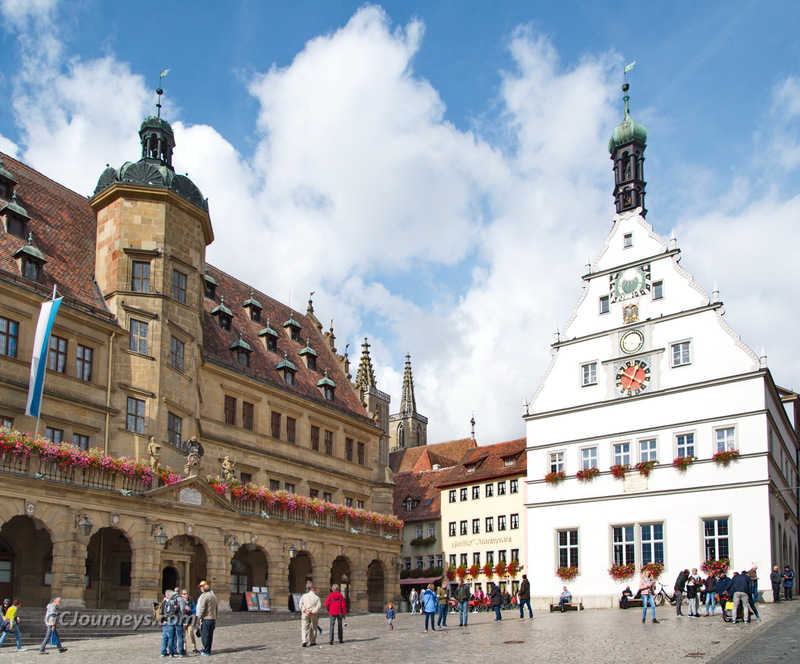 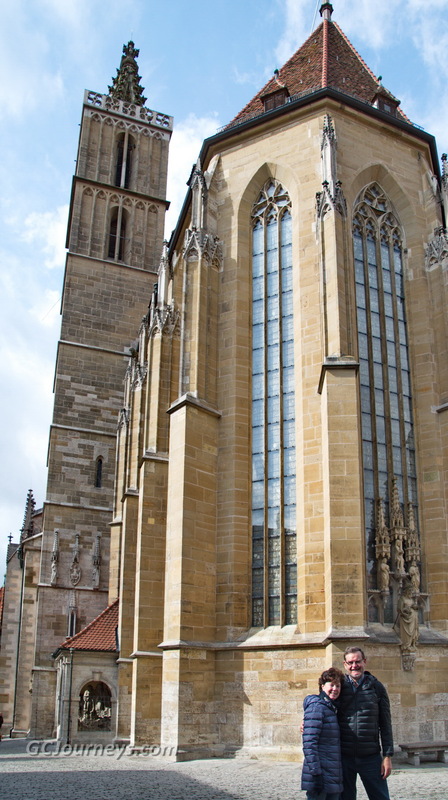 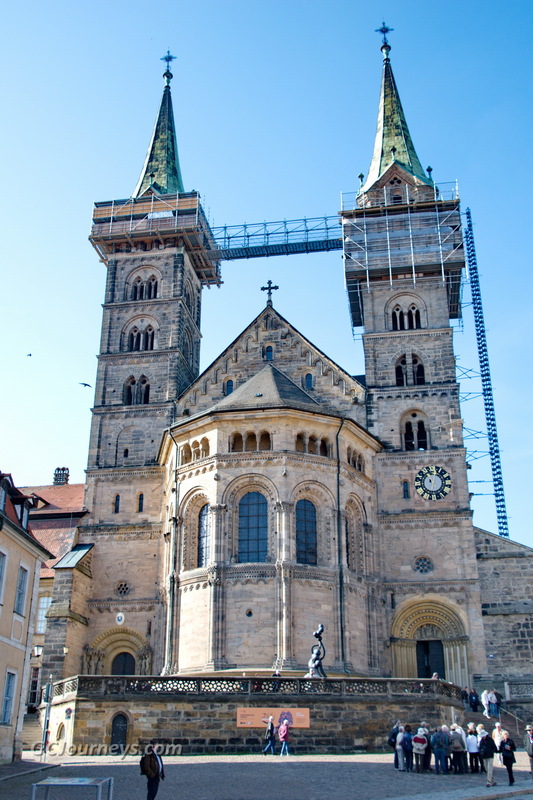 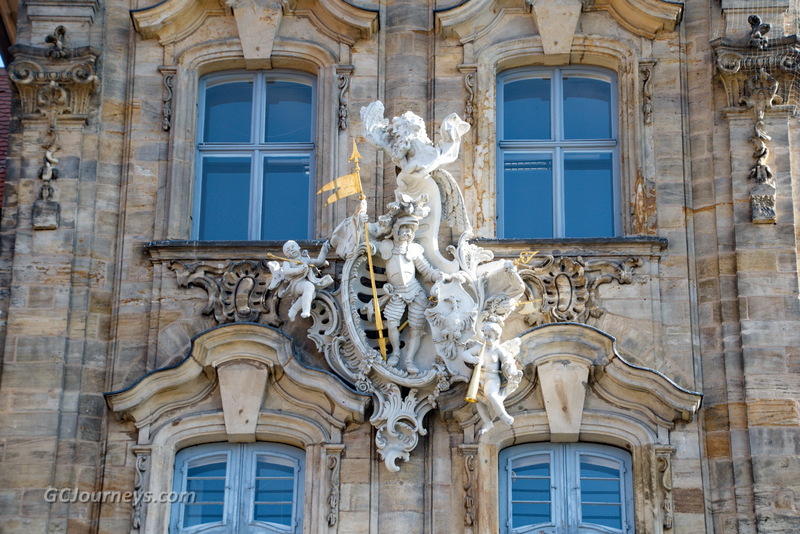 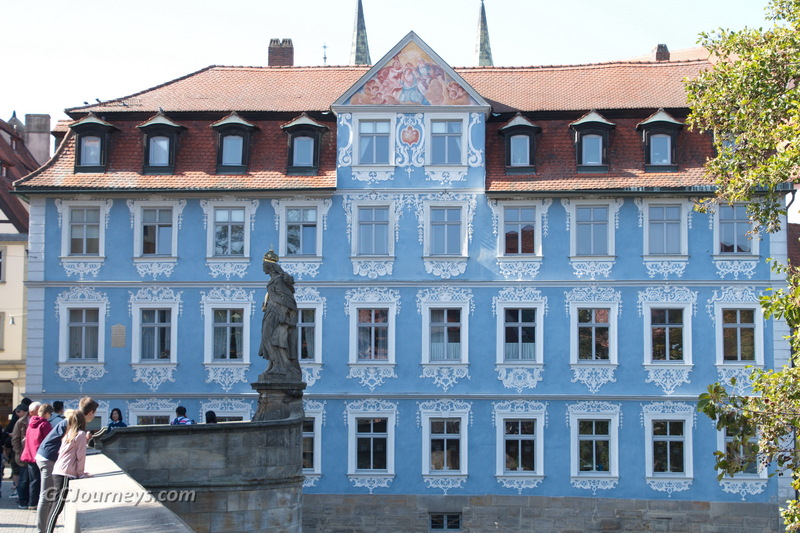 With more than 2,000 listed historical buildings Bamberg is a UNESCO World Heritage Site. 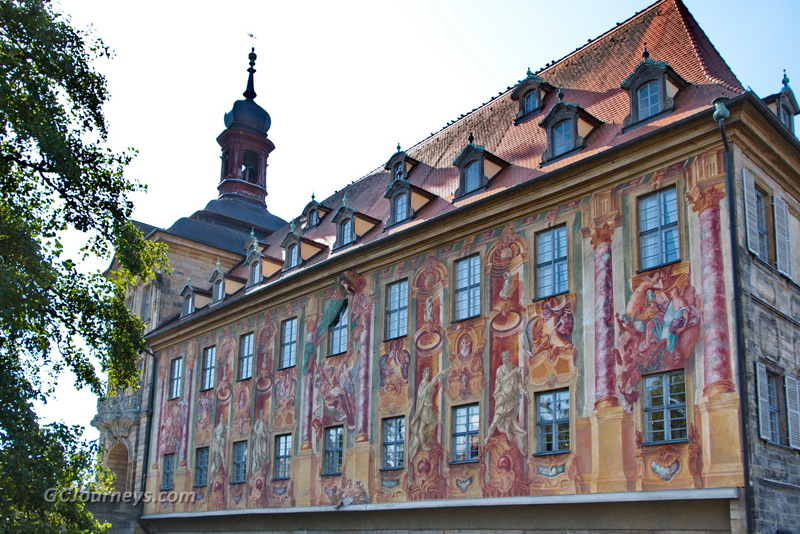 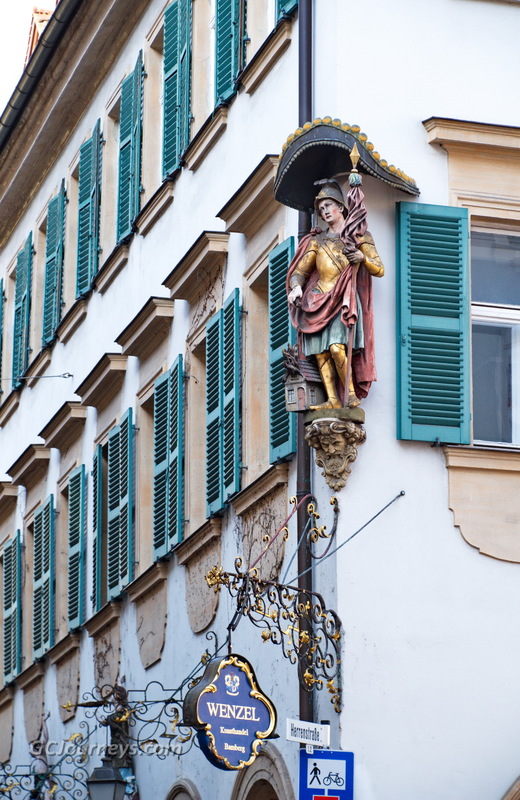 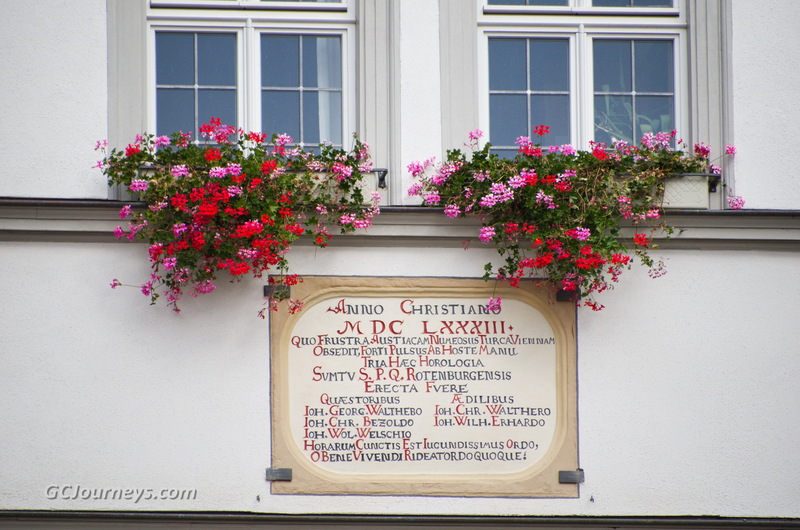 Places of interest on our tour included the 13,000-student Otto-Friedrich University founded in 1647 by Jesuit monks and housed in various historic buildings around town. 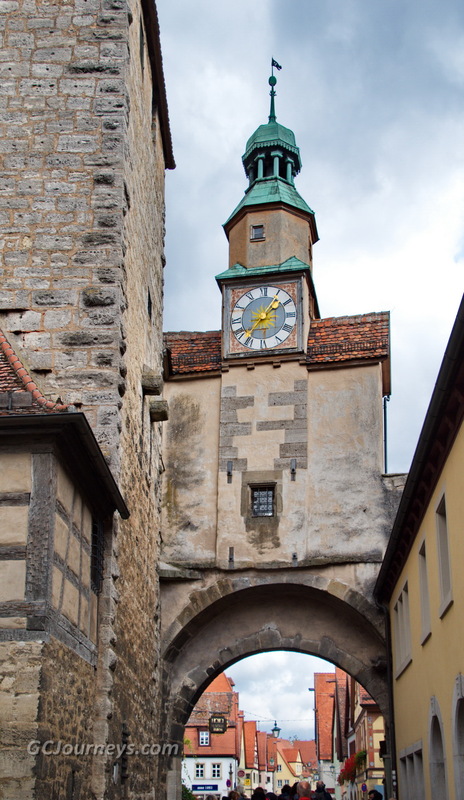 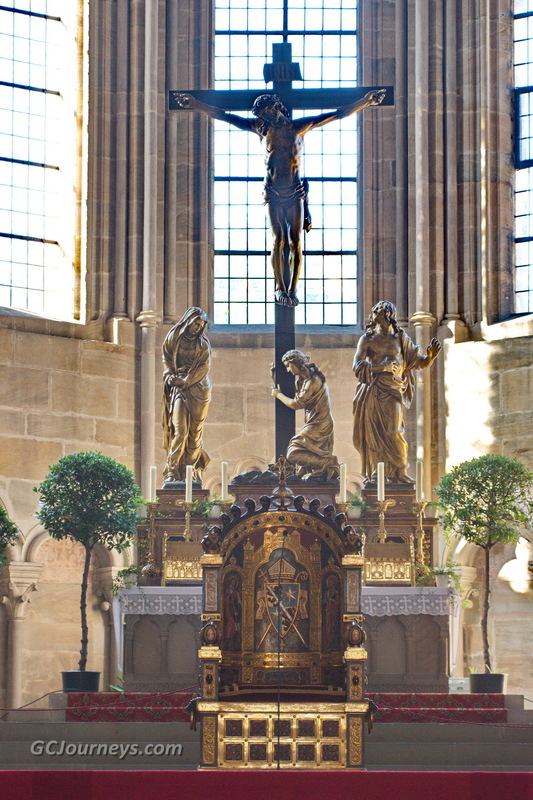 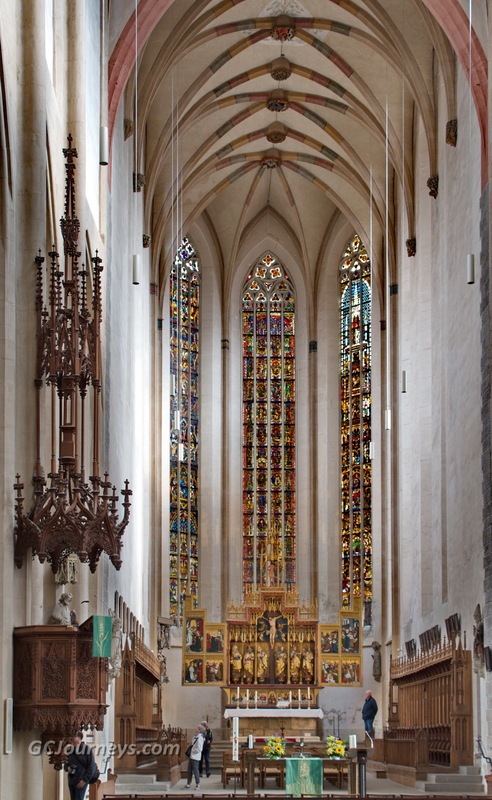 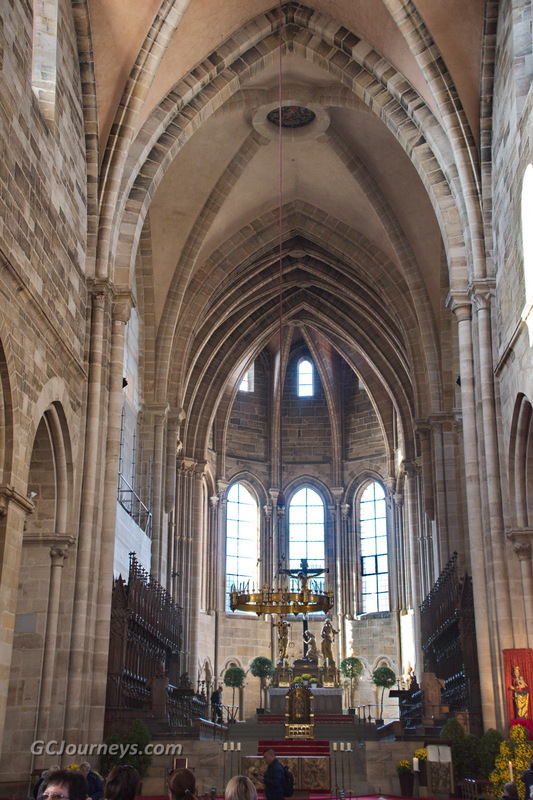 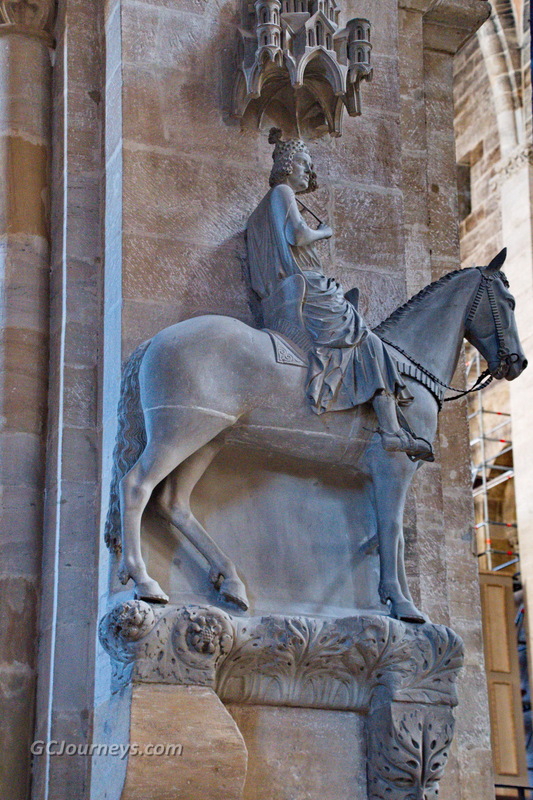 We also visited the Bamberg Cathedral of St Peter and St George which was consecrated in 1111 and completed during the 13th century and the town hall (“Rathaus”) which was rebuilt in 1744 on a tiny island in the Regnitz River, over a bridge that was built in 1455. 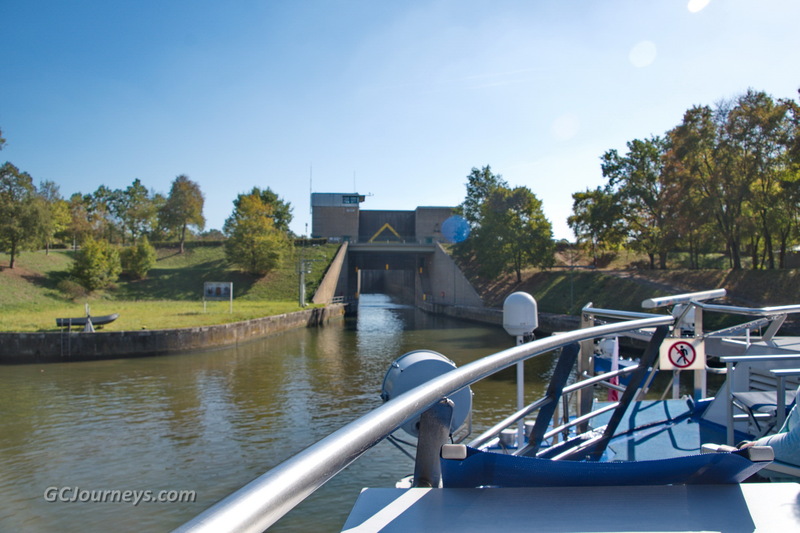 We were back on board for lunch as our ship traveled along the 106-mile long Rhine-Main-Danube (“RMD”) Canal. 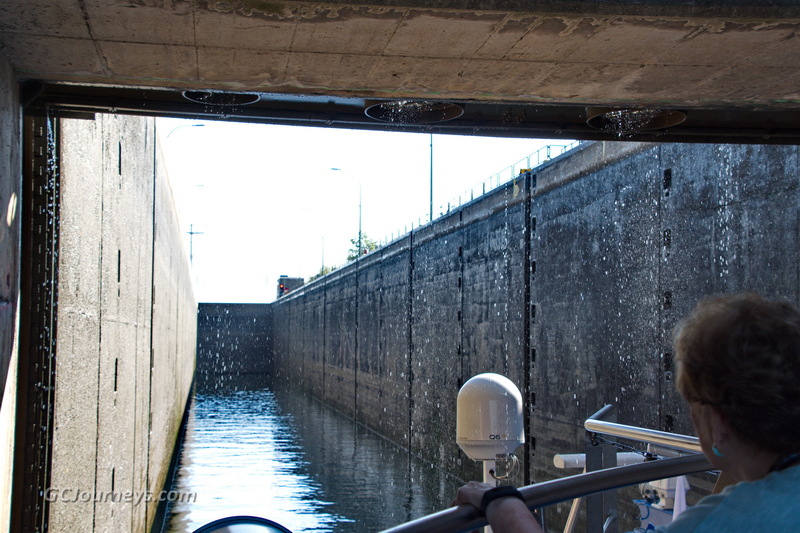 This engineering marvel was attempted in various projects dating from the year 793, but the canal was only successfully completed in 1992. 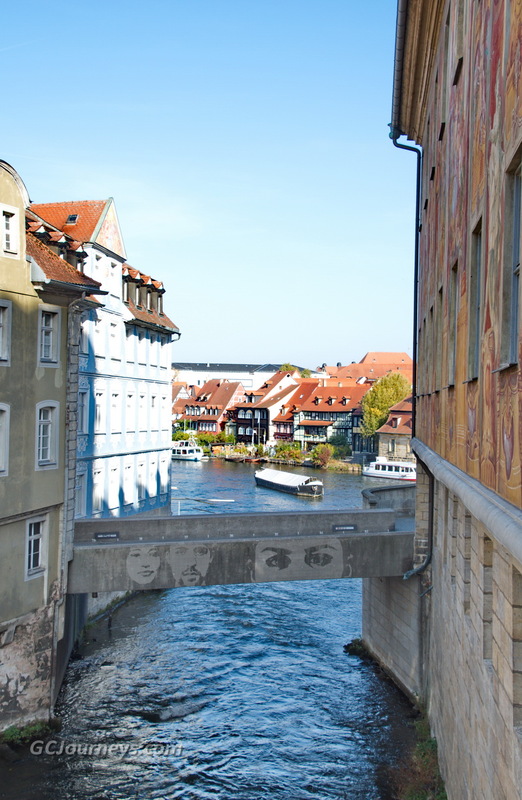 From Bamberg the canal passes through eleven locks ranging from 17 to 82 feet high to rise a total of 574 feet at its highest point, and then descends 232 feet through another five locks to the Danube.